Last night the loaner Yuba Mundo went home to Marin. It was fun while it lasted. I had, until a couple of weeks ago, never ridden a real longtail before, and as I’ve mentioned, it takes some getting used to. Our friends who were used to riding a Surly Big Dummy liked it a lot. “It carries three kids and you don’t even notice! And it’s cheap!” They are, of course, very used to riding with two kids on the back. In fact they rarely do anything else. My brother-in-law hated the Mundo. “I hate this bike,” he said. It was unclear whether it was the bike itself or the experience of riding any kind of long bike with two kids on the back. With hindsight I lean toward the latter. 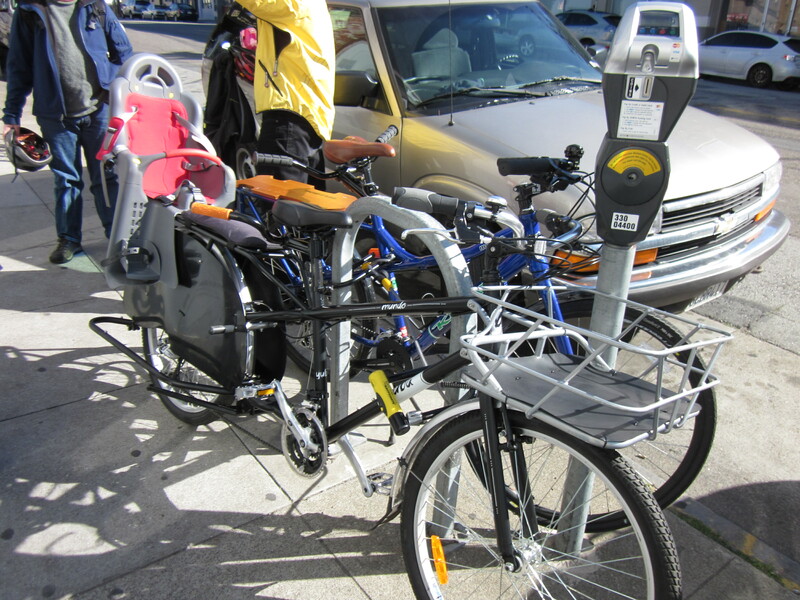 I really liked having the ability to carry two kids and a load of groceries in San Francisco (and this is particularly appealing for younger kids who need child seats). It is pretty amazing. People who live in flat areas with no hills to speak of love their box bikes (bakfiets, Madsens), but almost everyone agrees that those bikes won’t climb real hills, and getting down them on the other side raises safety issues. San Francisco has real hills. The Mundo may be heavy, but it cranks up the hills; I never had to walk it. Based on our experience so far, I now believe that people who live in hilly terrain should buy bikes from companies based in the San Francisco Bay Area, or maybe Seattle. There are things I would change about the Yuba Mundo. My personal pet peeve is dynamo lights; I think all family bikes should have them, and the Mundo does not (it’s not even an option). In San Francisco, the bike should be fitted with disc brakes (this is an option, and not an expensive one, either). The child seat mount would be infinitely better if it were possible to slide the seats forward and back, possibly on rails? I would have preferred the Peanut seat about 6 inches forward from where it was, because it leaned beyond the rear tire, which made the bike wag. And when I had only my daughter on board, I would have liked to slide it all the way forward, which would have made it much easier to get up steep hills and to talk to her. There are also a lot of things to like about this bike just as it is. It can move major-league weight, way more even than other long tail bikes. And you don’t even feel it except at the starts and stops. This is pretty amazing, especially considering the weight of kids and their gear. My two kids together are ~80lbs stark naked, but outside the house they always have clothing on, and on any kind of trip we add in lunches and book bags and toys. The weight adds up fast, particularly if you want to stop and pick up groceries. (And if the weight gets out of hand as the kids get older, Yuba sells an electric version, the elMundo.) The Bread Basket was unnerving to ride with at first, but absolutely awesome. When it was loaded up I barely noticed riding over potholes or Muni tracks. Our son loved the soft seat cushion and wants one for the MinUte. And the bike acoustics are good; this may sound like an odd concern, but it’s useful to be able to hear the kid in the back. Our kids liked riding on this bike. They called it The Beast. Yuba sometimes bills the Mundo as a minivan replacement, but I don’t quite agree with that. Minivans are plusher. The Mundo reminds me more of a pickup truck; stripped down but effective at moving stuff where you need to go. Yuba is like the Ikea of bicycle manufacturing, peeling off everything optional to keep the bike at a price point that does not make novice riders laugh in disbelief. As long-term recovering cheapskates (we’re so cheap that we bought our Ikea furniture on craigslist, given that the kids are going to trash it anyway), I like that there’s a cargo bike manufacturer with this business model. In contrast, a bike like the Surly Big Dummy is more of a station wagon concept car, which can be customized to do anything you want, but only if you know what to ask for and can swallow the price. The minivan of bikes is the box bike. Would we get a Mundo? No, but that’s not a knock against it, but a statement about our lifestyle. We wouldn’t get a Mundo for the same reason we don’t have a back yard. We’ve made a choice to live in a large city, and that choice involves some compromises. We have, by city standards, amazing bicycle storage, but even we had to rearrange that space around the Mundo. 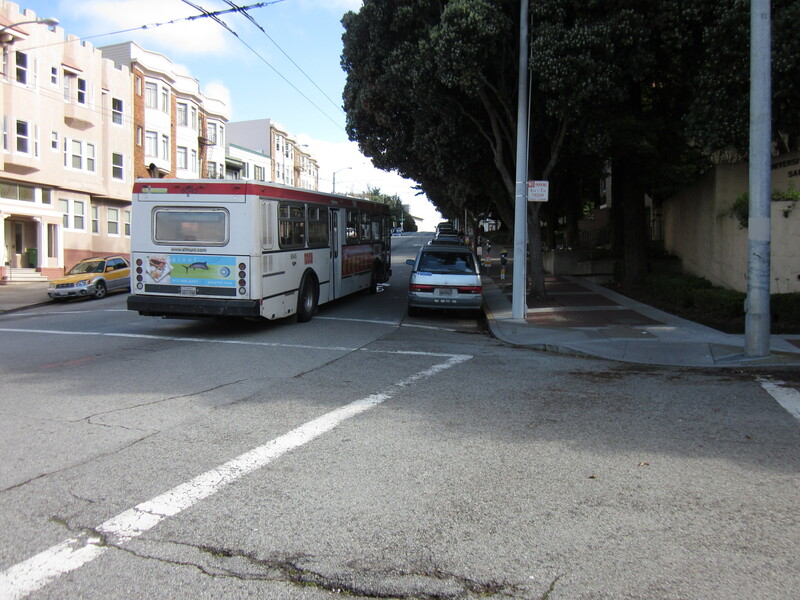 San Francisco has serious traffic, and maneuvering a big bike through it led to some frustrating moments; another bike would whiz through a pinch point in front of me, and I would realize I had to wait until it cleared. Parking the bike, even at bike racks, always involved a little jiggering around tight corners and other bikes—I was in that situation when the Mundo fell over. There is a lot of starting and stopping in the city, and that is difficult with a heavy bike. The Kona MinUte, we’ve realized, may represent the outside range of bikes that we can handle in San Francisco. I wasn’t surprised when the Yuba rep told me that most of their customers lived in inner-ring suburbs or smaller cities. That seems like this bike’s ideal stomping ground. The Costco run holds no fears for the Mundo. We are lucky devils indeed to live in San Francisco, and being shut out of a few categories of bicycle seems like a small price to pay for the privilege. 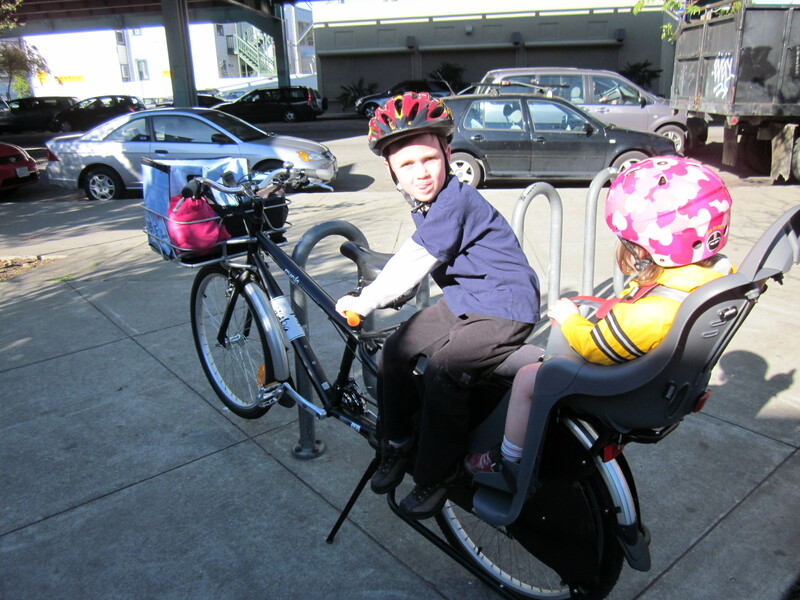 I’m glad we had the chance to try the Yuba Mundo, and although we won’t miss figuring out where to put it, all of us, especially the kids, will miss having the chance to ride it sometimes. Hi! Found this post through the ping back on Family Ride. Just one more thought about your criteria for picking bikes: kids with special needs. We are in Portland, which is not as flat as some think, but obviously not SF. We bought a bakfiets (used on Craigslist) because I need our son who is too big for a typical kids bike seat to be buckled in. He has Down syndrome and his language delays mean that I cannot trust he would hold on if we did a longtail set-up. I don’t have any kind of e-assist yet, but it’s on my wish list. As it is, I just get off and walk it sometimes. Also I have laid down the bakfiets with and without kids in it several times. They don’t care anymore. The first time gave them both a start, but it was also the first time they had ridden in it. Tip #2: if you buy a bike used get it tuned up before you plop the kids in. As a newbie I thought all the wobbling was me, but it wasn’t. I was instantly more stable after the tune-up. That’s a great point about kids with special needs, which I hadn’t considered. Would your son be safe in a recumbent trailer-bike like a Weehoo? If so that might be another option for parents here, somewhat cheaper than a bakfiets+electric assist, but probably able to make it up real hills. My kids aren’t quite as sanguine about being knocked off the bike yet, but it’s nice to hear that they may get there someday. Hey! Loved the article. On quick point of clarification – the price of a Metrofiets. They Start at just under $4,000 for a completely built up rolling bike. This includes your choice of a box or a crate with an external 9 speed drive train, disc brakes etc. I updated the post; thanks for letting me know! Hi, came across this as I was searching online for used Mundos. It seems like the Mundo would probably work all right here in St. Louis, MO, but I appreciate the points you bring up to consider. Though I don’t see bringing the bike on it often, I was wondering if the Mundo (or similar-size longtail) would fit on our MetroLink (our light-rail system) cars. The low price is certainly very attractive, especially because we’re unlikey to find a used longtail here. I look forward to reading more of your blog.